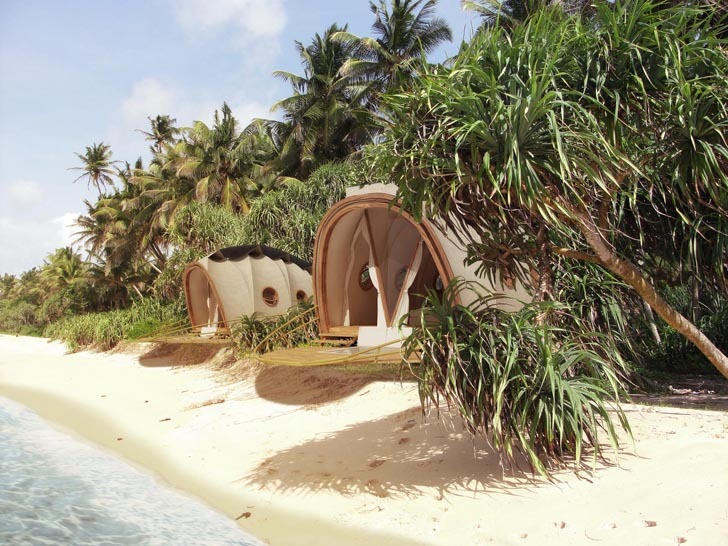 Nomadic Resorts just unveiled The Looper - a new prefab pod dwelling that can pop up virtually anywhere! The low-impact shelter incorporates a wastewater treatment system and it's powered by renewable energy. The nomadic dwelling is perfect for jungles, mountains, or beaches, and it can move from one exotic location to the next without disturbing the land it settles upon. Nomadic Resorts’ mobile Looper pod is made from a lightweight tensile fabric stretched over a sustainably sourced wooden frame. The structure’s shape was inspired by the form of caterpillars – it’s made up of segments that fold out to create a curvilinear structure. Each pod includes a bathroom, a large changing room, an air-conditioned sleeping area, a small office with Wifi, and an indoor/outdoor lounge complete with entertainment system. With the flick of a switch, the indoor lounge’s roof opens to reveal the sky, bringing guests into the outdoors without leaving their pod-suite. Each pod is capped with a solar canopy that powers LED lights and an extremely efficient air-conditioning system. Water is provided by a rainwater harvesting tank that recycles wastewater, and hot water is generated by a solar heater. The shape of the pod is designed to encourage cross ventilation and provide shade, and the exterior membrane is recyclable, but also durable enough to last for decades. At night when lit from within, the pods look like glowing arthropods on the terrain. 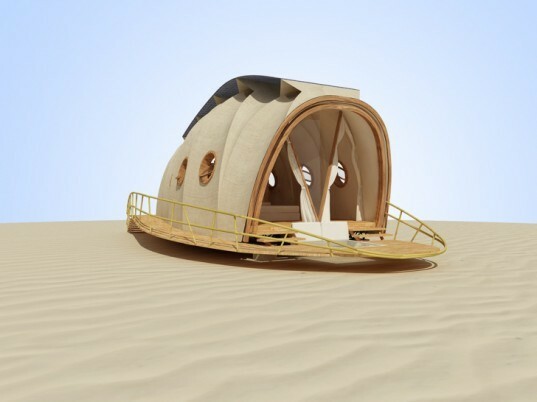 The versatile Looper pod can be constructed on sand dunes in the desert, on rafts for floating resorts, or even added to an existing structure. I live in Washington state in the woods at the base of Mt. Rainier. Could someone contact me regarding having one set up on my property. Absolutely love it. Would buy now!! It would be helpful to list prices on the Looper. I visited the Nomadic Resorts web site and did not find prices there either. I am thinking that these are perhaps priced for the 1% crowd and that is why the prices are not listed. The old "if you have to ask you can't afford it" mentality is just that...old. Looks like a good design, I would like to buy one, I think...too bad there is no price listing. Hi I am Louis Thompson founder of Nomadic resorts. Thanks for your interest. Firstly I think I need to clarfify the size of the Looper - the looper is 10m long, 4.5m wide and 3.5 m high - 45m2 or 485ft2 for our american friends. This is the size of a typical one bedroom appartment. For Dan- the looper is a membrane structure which will last for 15+years - the pricing starts at 35 000USD. For Duncan - well spotted - the rainwater collection tank acts as ballast to weigh the tent down and there are small footings. Christina - we are currently building the protoype and hope that we will be ready to ship later in the year...we will keep information updated on our facebook page. I think I can say that we are overwhelmed by the positive response and will keep you updated on our first resort. What about wind? Does it have a method of securing it to the ground? Like really big earth bolts? How much does it cost, and where can one be bought? Nomadic Resorts’ mobile Looper pod is made from a lightweight tensile fabric stretched over a sustainably sourced wooden frame. The structure's shape was inspired by the form of caterpillars - it's made up of segments that fold out to create a curvilinear structure. Each pod includes a bathroom, a large changing room, an air conditioned sleeping area, a small office with Wifi, and an indoor/outdoor lounge complete with entertainment system. With the flick of a switch, the indoor lounge’s roof opens to reveal the sky, bringing guests into the outdoors without leaving their pod-suite. Each pod is capped with a solar canopy that powers LED lights and an extremely efficient air-conditioning system. Water is provided by a rainwater harvesting tank that recycles wastewater, and hot water is generated by a solar heater. The shape of the pod is designed to encourage cross ventilation and provide shade, and the exterior membrane is recyclable, but also durable enough to last for decades. At night when lit from within, the pods look like glowing arthropods.